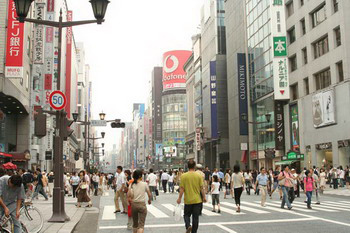 As the largest city in Japan and the location of the country's largest broadcasters and studios, Tokyo is frequently the setting for many Japanese movies, television shows, animated series (anime), and comic books (manga). The best-known outside Japan may be the kaiju (monster movie) genre, in which landmarks of Tokyo are routinely destroyed by giant monsters such as Godzilla. Many comics and animated series are set in Tokyo, such as Sailor Moon, Ranma ½, Azumanga Daioh, Yu-Gi-Oh! and even the western animation Hi Hi Puffy AmiYumi, have become popular across the world as well. Some futuristic manga and anime such as Akira often depict Tokyo as a sprawling metropolis in a post-apocalyptic setting; some often go so far as to have numbers designating different Tokyos. Some Hollywood directors have turned to Tokyo as a filming location. Well-known examples from the postwar era include Tokyo Joe, My Geisha, and the James Bond film You Only Live Twice; well-known contemporary examples include Kill Bill, The Fast and the Furious: Tokyo Drift and Lost in Translation. Tokyo was used a setting where the monkeys invade in the video game Ape Escape Million Monkeys.